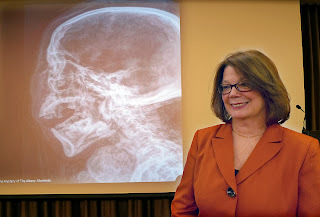 The Albany Roundtable has a fascinating speaker lined up for its November 13th luncheon; Tammis K. Groft, executive director of the Albany Institute of History & Art, is expected to discuss the Institute’s latest exhibit, GE Presents: The Mystery of the Albany Mummies. The story of the Albany Mummies centers on two Ancient Egyptian mummies and their coffins. Albany Institute board member Samuel Brown purchased the 3,000 year old mummies and coffin bottoms from the Cairo Museum in 1909. Plans for a major exhibition began seven years ago with new research, including analysis of the of the hieroglyphs on the coffin parts which indicated it belonged to Ankhefenmut, a priest and sculptor who lived between the years 1069 and 945 BC. 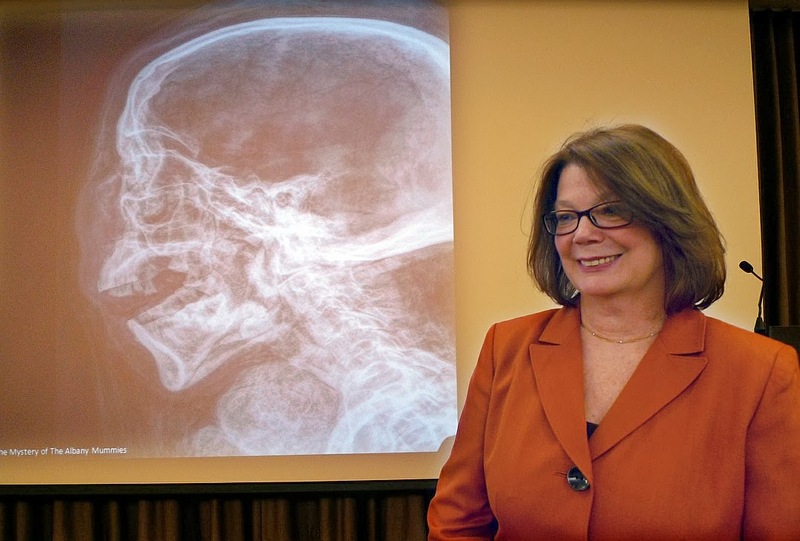 X-Rays and CT Scans performed by Albany Medical Center also yielded surprising results. The Albany Institute of History & Art is one of the oldest museums in the United States (founded 1791) and is a major repository for the region's history and cultural heritage. Ms. Groft was appointed executive director of the Institute in 2013. She began as an intern in 1976 and was hired as Assistant Curator of Collections and Exhibitions in 1978. Since then, she has assumed increasing responsibilities and has served as chief curator since 1987. She has organized and researched or supervised the development of over 70 exhibitions highlighting the history, art and culture of the Capital Region. Ms. Groft also serves and an Adjunct Professor for the Public History Program, SUNYA and teaches a Graduate course called Curatorial Practices. She is currently on the Board of Directors of the Williamstown Art Conservation Center, in Williamstown, MA. Ms. Groft holds an MA in American Folk Culture from the Cooperstown Graduate Program, State University of New York at Oneonta, and a BA in Anthropology from Hartwick College, Oneonta. The cost for the luncheon is $20, which may be paid at the door. The Roundtable is also offering its guests the option of paying in advance with a credit card at www.albanyroundtable.com. The University Club will serve a hot and cold buffet from 12:00 noon to 1:00 p.m., with the program commencing at 12:30. Reservations for the November 13 luncheon are required by November 11 and may be made by prepaying online, by calling 518-431-1400 (the Albany Colonie Regional Chamber of Commerce) or by sending an e-mail to albanyroundtable@yahoo.com. That's great ,keep it up!